Today, the legal team for Steven Donziger and the Ecuadorians targeted by Chevron's retaliatory RICO suit filed a motion—filled with devastating detail—to strike the testimony of the oil giant's star witness. That star witness, disgraced former Ecuadorian Judge Alberto Guerra, testified during the RICO trial last week that representatives of the Lago Agrio Plaintiffs secured the opportunity to ghostwrite the 2011 judgment against Chevron issued by the Ecuadorian court by promising the presiding judge $500,000. Well, I guess Chevron can rest its case. Silver bullet. Or, more like magic bullet. One of the main problems with the story—besides the fact that it never happened—is that after weaving his tall tale, Guerra admitted that he had offered between ten and twenty bribes to judges during his career as a lawyer and after becoming a judge, accepted about the same number of bribes, sometimes for as small as $200, to "fix" cases. Guerra further understood from multiple conversations and lunch meetings with Chevron attorneys—where, as Guerra’s testimony revealed, they always fully heard out his offers and consulted with their principals before allegedly saying “no”—that as an out-of-work former judge with no role in the case, he simply didn’t have the “goods” Chevron wanted. Guerra had every incentive to manufacture those goods so that he could bargain hard with Chevron about the price of his testimony. And bargain he did, lying repeatedly to Chevron—i.e., that he was in possession of emails that would confirm Chevron’s ghostwriting allegations; that he possessed drafts of the Judgment; that the Lago Agrio Plaintiffs had recently offered him $300,000 to cooperate—in order to improve his bargaining position. 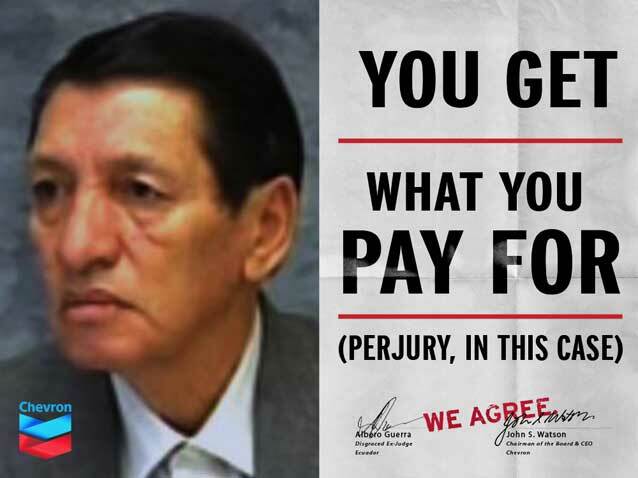 When, after a long career of paying and accepting bribes, Guerra apparently decided that he would place himself in the service of Chevron, the former judge was earning $500 per month and had no savings. In contrast, Chevron has committed to paying Guerra, for a period of at least two years, a “salary” of $10,000 per month—20 times more than he was earning in Ecuador. It is unclear what need Guerra has for such a generous salary, in light of the fact that Chevron also: (i) provides Guerra with a monthly $2,000 “housing allowance”; (ii) bought Guerra a car and is paying for his auto insurance; (iii) is paying for health insurance to cover Guerra, his wife, his son, his son’s wife, and his grandchildren; (iv) paid Guerra roughly $12,000 to purchase household items upon his move to the U.S.; (v) paid Guerra’s moving expenses, including five airline tickets, transportation of personal items, and a temporary hotel stay upon arriving in the U.S.; (vi) paid Guerra roughly $50,000 in exchange for “evidence,” including $10,000 for belatedly finding a single document that supposedly eluded Guerra upon prior searches because it was “stuck” to something else; and (vii) pays the legal fees of Guerra’s various attorneys, including the fees of the lawyers handling immigration issues for his various family members. Guerra’s relocation on Chevron’s dime also reunited him with his daughter and a second son, who live in the U.S. and who Guerra had not seen in several years. In other words, Chevron is bribing a judge to say that Donziger bribed a judge. And the package Chevron has put together for this judge is outrageous, and egregiously runs afoul of federal law and ethical rules of conduct. The bottom line is that Guerra is and apparently always has been desperate for money, and will stoop to extraordinary lows to get it—including fabricating a story for Chevron, weaving big lies with small truths in an effort to create the illusion of a verified account. Guerra’s recent testimony only serves to drive his unreliability home. The motion is well worth reading in its entirety as it also highlights the admitted lies, the contradictions, and the suspect assertions in Guerra's testimony, as well as the total lack of anything approaching corroborating evidence for his explosive allegations. During cross-examination, Guerra explained that he spent 3-4 days of every week for 3 full months in New York working with a team of Gibson Dunn lawyers led by Randy Mastro in preparation for his two days in court. That should be enough time for even a novice actor to learn his lines, no matter how fanciful a story he’s telling. And hey, if it means reuniting with his beloved family in the United States, where he’ll enjoy a lifestyle he could only dream of before, it’s time well spent. And then some. Simple. 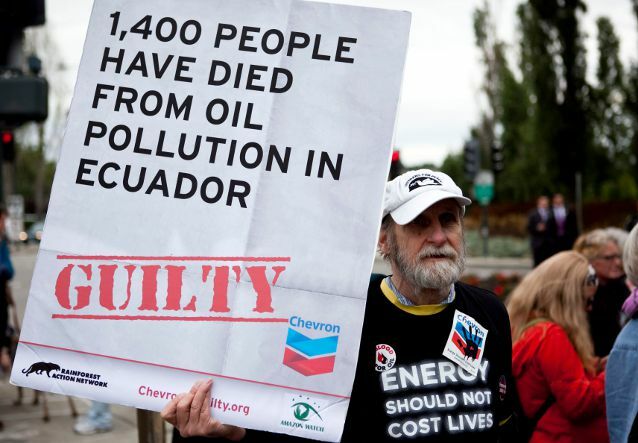 Guerra’s testimony is Chevron’s ‘magic bullet’ to save its RICO case and help the company avoid paying the $19 billion judgment for its devastation of the Ecuadorian Amazon. If it worked, it would be money well spent. And with a biased federal judge presiding, it probably will work – until a real court, the Second Circuit Court of Appeals, reviews the matter down the road. Never mind that the money spent on bribing Guerra to fabricate his story could be used to clean up the company’s contamination in Ecuador. But for Chevron, living up to its legal and moral responsibilities overseas would set a terrible precedent. In the end, Guerra’s preposterous testimony, bought and paid for by Chevron, his court performance the culmination of months of preparation by a team of highly-paid lawyer-thespians at Gibson Dunn, adds one more layer of absurdity to the farce that the current proceedings represent. A single federal judge in New York can no more act as an appellate court for the entire Ecuadorian Judiciary than Alberto Guerra’s words can be taken as the truth. And Chevron can no more hide from the truth than the company’s legal machinations can conceal its contamination, and its liabilities, in Ecuador. Steven’s letter goes on to enumerate in detail issues in the proceedings currently underway, including prohibitions by the judge against using evidence of Chevron’s liability for contamination in Ecuador, and no ruling yet from the judge as to whether Steven will be allowed to testify in open court (as opposed to only by written declaration). Read and/or download the letter here (PDF document). Every day, human rights defenders around the world risk their lives to stand up against injustice. Whether investigating government abuse in Syria or Russia, or exposing corporate abuse in Nigeria or Ecuador, brave individuals everywhere depend on fundamental rights of free speech to do their work. The United States has always celebrated such rights as vital to our democracy—after all, there is a reason that the First Amendment came first. Yet recent trends, bolstered by a series of federal and Supreme Court cases, have privileged the free speech rights of corporations while silencing the living, breathing human beings that need those rights most. It’s certainly no news that today’s corporations enjoy unprecedented global power. Likewise, the corporate lobby’s campaign to stifle human rights activism has been steadily increasing. Since Citizens United, which extended First Amendment rights to corporations as “persons”, we’ve seen bold legal arguments against laws and regulations that would hold them accountable to fundamental human rights law. This year, for example, the Supreme Court held in Kiobel v. Shell that Nigerian survivors of torture and crimes against humanity could not seek justice against Shell in U.S. Courts. The “mere corporate presence” of Shell in the U.S. was not enough for the Court to allow the plaintiffs—lawful residents of the U.S.—to bring their case. Courtroom doors that have been open to the world’s powerless for over 30 years are now closing thanks to a concerted effort by the most powerful. Yesterday, the Supreme Court heard arguments in a case that could push this dangerous precedent even further. Largely outside the radar of the human rights community, DaimlerChrysler AG v. Bauman arises out of the company’s alleged participation in targeting labor activists in Argentina’s Dirty War, a period of terror that involved the murder, torture and disappearances of thousands of activists and political dissidents. The allegations are chilling: Mercedes-Benz Argentina identified workers within its plant as “subversives” to state security forces, knowing full well that, as a result, those workers would be abducted, tortured, murdered or “disappeared”. Equally chilling is the prospect that the Supreme Court will enshrine corporate rights over human rights in law once again. Like Shell in Kiobel, the question is whether the German company is legally present in the U.S. for purposes of jurisdiction. Daimler says that it has a constitutional right to be treated separate from its subsidiaries. Where that right exists in the constitution is up to anyone’s imagination. Unfortunately, it’s not just the Supreme Court that’s privileging corporate rights over human rights. The American Petroleum Institute (API) sued the Securities and Exchange Commission (SEC) earlier this year, arguing a First Amendment right to make secret payments to foreign governments. The case concerned Section 1504 of the Dodd-Frank Act which would require oil, gas and mining companies to disclose the payments they make to foreign governments, making this information available to the people living in resource-rich countries for the first time. Such transparency regulations prevents corruption and promotes human rights, not least access to vital information that citizens in resource-rich countries require to demand accountability from their own governments. Yet the API argued that the First Amendment allows them to conceal such payments, and the SEC is now revising their rule. Finally, we have seen the rise in SLAPP (Strategic Litigation Against Public Participation) suits by corporate defendants against the human rights attorneys and NGOs that have advocated against them. Perhaps the most extreme, but certainly not the only, example of this has been the tactics that Chevron has employed this year against all advocates criticizing their human rights and environmental abuses in Ecuador. Faced with an $18 billion judgment against it for environmental devastation in the Amazon, Chevron has relentlessly targeted the organizations, lawyers, journalists and activists who have campaigned or publicly spoken out about the company’s destructive operations in Ecuador. In spite of sanctions and other judicial admonishments, Chevron’s lawyers have continued to SLAPP activists with harassing subpoenas and depositions, undoubtedly aimed at chilling the future First Amendment activity that makes their company look bad. EarthRights has defended these organizations, like Amazon Watch, but in spite of successful defense, Chevron’s legal machine continues these abusive practices. Sadly, these cases are not new or unique. Human rights advocates have always faced an uphill battle, especially when taking on corporate abuse. What is new is the way in which our highest courts are privileging corporations and their rights over those of actual human beings. SLAPP suits and corporate tactics aimed at discouraging human rights advocates from speaking out and demanding justice are time-tested. But the aggressiveness and vigor with which Chevron has been allowed to pursue such tactics is new, and other corporations are following suit. We must ask ourselves this question: How can we speak truth to power when those with power have more rights to speak?